We reported new class of BCL6 inhibitors in J. Med. Chem. We published new series of menin inhibitors in J. Med. Chem. We have published paper "BMI1 regulates PRC1 architecture and activity through homo- and hetero-oligomerization" in Nature Communictions. We have published review H3K36 methyltransferases as cancer drug targets: rationale and perspectives for inhibitor development in Future Medicinal Chemistry. We published development of potent BCL6 inhibitor in collaboration with groups from Cornell and University of Maryland. David Rogawski defended his PhD thesis. Congratulations Dave! We published paper "Property focused structure-based optimization of small molecule inhibitors of the protein-protein interaction between menin and Mixed Lineage Leukemia (MLL)" in the Journal of Medicinal Chemistry. We determined structure of ZMIZ1 TPR domain and published paper in collaboration with Mark Chiang: The PIAS-like Coactivator Zmiz1 Is a Direct and Selective Cofactor of Notch1 in T Cell Development and Leukemia. Published in Immunity. Our manuscript "Two loops undergoing concerted dynamics regulate activity of the ASH1L histone methyltransferase" has been published in Biochemistry. Our study "Rational design of orthogonal multipolar interactions with fluorine in protein-ligand complexes" has been published in Journal of Medicinal Chemistry, selected as Editor's choice. Felicia Gray defended her PhD thesis: "Dissecting Bmi1 protein-protein interactions through chemical biology". Congratulations Felicia! We have published study demonstrating that menin-MLL inhibitors block activity of MLL fusion proteins in a mechanism independent on fusion partner. Published in Leukemia. George Lund defended his PhD dissertation: "Targeting CDC25B-CDK2/CyclinA Activity Using Chemical Biology Approaches". Dr. Chinnaiyan's lab discovered role of menin and demonstrated efficacy of menin inhibitors in castrate resistant prostate cancer. Study published in Nature Medicine. Our team work resulted in development of potent inhibitors of menin-MLL interaction with strong efficacy in animal models of leukemia. Published in Cancer Cell. We have licensed menin-MLL inhibitors to Kura Oncology for further development. Jola is co-author on study to develop small molecule inhibitors of CBFB-SMMHC: "A small-molecule inhibitor of the aberrant transcription factor CBFβ-SMMHC delays leukemia in mice" published in Science. Our study Inhibition of CDC25B Phosphatase Through Disruption of Protein-Protein Interaction has been published in ACS Chemical Biology. Jola has been elected to the University of Michigan Medical School "League of Research Excellence". Congratulations to Jola! Our study "The same site on LEDGF IBD domain represents therapeutic target for MLL leukemia and HIV" has been published in Blood. George's publication "Solution NMR studies reveal no global flexibility in the catalytic domain of CDC25B" has been published in journal Proteins. 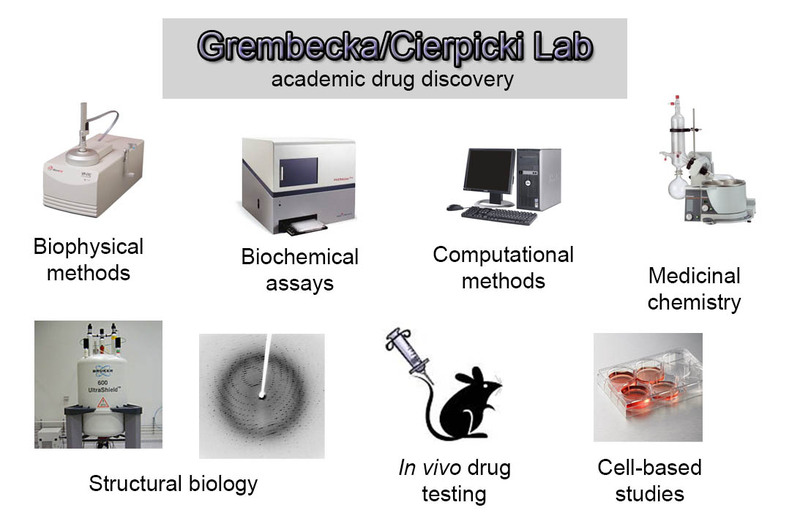 The focus of the Grembecka/Cierpicki laboratories is discovery and development of small molecules for targeted therapies in cancer. Targeted cancer therapies use drugs that inhibit growth of cancer cells by blocking proteins directly involved in cancer cell division and spread. By focusing on inhibiting proteins directly involved in molecular and cellular changes that are specific to cancer, targeted cancer therapies are more effective and much less harmful to normal cells than other types of treatment, including chemotherapy and radiotherapy. We are particularly interested in development of small molecules targeting protein-protein interactions involved in leukemogenesis and other tumors. Currently, we are working on development of small molecules inhibiting MLL fusion proteins in acute leukemias by targeting the menin-MLL-LEDGF complex, with the overall goal to advance these compounds to clinical trials in the MLL leukemia patients. Our group is also pursuing development of small molecules targeting other proteins involved in oncogenesis. This includes Cdc25 phosphatases, and several epigenetic drug targets relevant to hematologic or solid tumors. The research in Grembecka/Cierpicki lab. is high interdisciplinary, and includes medicinal chemistry, biochemical, structural biology, biological and in vivo animal studies for lead identification, optimization and development to advanced pre-clinical stages in animal models. We also collaborate closely with the pharmacokinetic group for the DMPK studies to further support our drug discovery efforts.